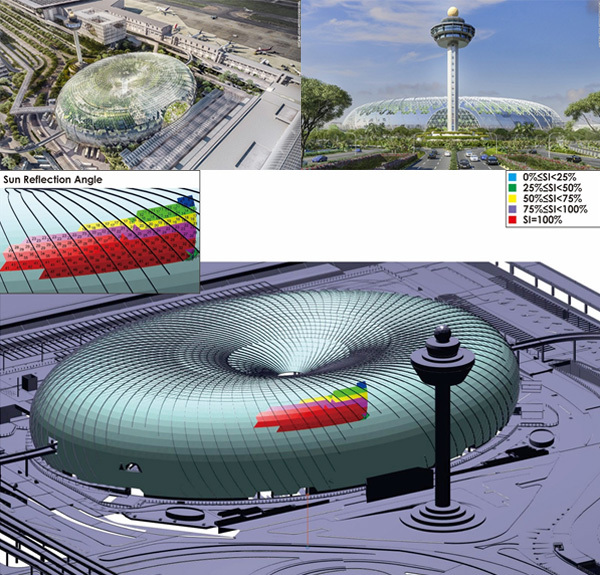 Windtech Consultants have developed an in-house reflectivity analysis technique to analyse solar light reflectance associated with the Jewel Changi project, consisting of a glass the biosphere structure at the Changi Airport in Singapore. The technique was developed after a request to provide guidance on the impact of glare from the building façade and solar panels which are to be attached to Jewel Changi project. Due to the complexity of the Jewel Changi building form, including adjacent surfaces which are non-planer in addition to numerous aspects, a standard solar light reflectivity study could not be relied upon for this complex study. Since Windtech Consultants conception in 1991, Windtech have worked on over 1,000 solar reflectivity studies including the Burj Khalifa which included advice regarding the impact of solar glare on aircraft. However solar glare is not an issue limited to aircraft as it can also irritate occupants of neighbouring buildings, motorists and pedestrians as was the case with Jewel Changi Airport project which found that certain panels of the façade of the airport may cause adverse solar glare. Due to a proprietary ray tracing software developed by Windtech Consultants, recommendations were provided for this challenging study to mitigate this adverse effect and enable compliance with the planning control requirements. Windtech are honored to work with Changi Airport which has been the winner of multiple best airport awards over the years, and served over 54 million passengers in 2014. Located on the site of the old parking lot fronting the existing Changi Airport’s Terminal 1, construction is already underway for the Jewel Changi project which when finished, will boast this impressive steel and glass biosphere-style structure filled with plants and a gigantic waterfall. The centerpiece of the Jewel Changi will be Forest Valley which is a 5-storey garden with thousands of trees, ferns and shrubs which maintain Singapore’s reputation as the ‘garden city’.